Let the Garden Help You Be a Healthier You! At Lewis Ginter Botanical Garden, our mission is education and our passion is bringing people and plants together to improve communities. By providing beautiful outdoor spaces we can help Garden Members and the Richmond community be healthy, active and enjoy nature. Our campus, 80 acres, with 50 acres under intense cultivation, allows plenty of room for walking — either at a leisurely pace enjoying the blooms, with a tot in a stroller, or with a walking buddy at a fast clip. The Garden is lucky to have over 600 volunteers, 14,000 Garden Members and nearly 350,000 visitors each year. They come to the Garden to be outside, and enjoying all the flora that nature has to offer. Lewis Ginter Botanical Garden offers year-round beauty. Whether you are dancing a jig to the gourd orchestra at Goblins & Gourds in the fall, walking Dominion GardenFest of Lights in winter, climbing the ramp to our accessible-to-all CWD Kids Tree House for a birds-eye view of the Garden, or running through the WaterPlay sprinklers in summer, time spent at the Garden is time well-spent. Our staff & volunteers are dedicated to staying active too. Did you know that gardening is great exercise? Gardening is what we do! 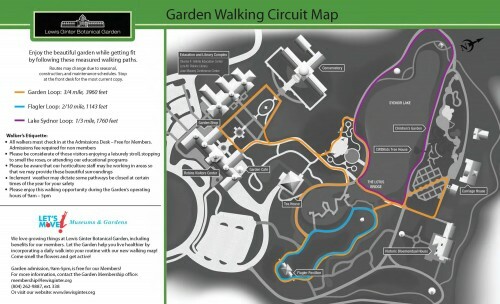 We’ve added a Walking Map of the Garden so you can track your walking miles as you keep an active and healthy lifestyle. The detailed map shows walking loops and distances: Garden Loop: 3/4 mile, Flagler Loop: 2/10 mile, Lake Sydnor Loop: 1/3 mile. 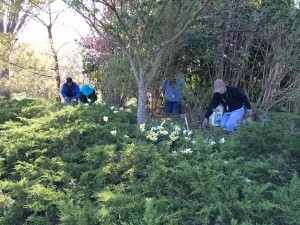 Lewis Ginter Botanical Garden is proud to be a Let’s Move Garden. Let’s Move is a national initiative to get kids moving and eating healthy food. It aims to support healthy children and families. Lewis Ginter Botanical Garden helps make the Richmond Region a more attractive and vibrant place to live and work, with beautiful sites that encourage an healthy and active Richmond. In 2015 we celebrated our second year as an Active RVA certified workplace.